The opening of the Tunnel really jolted the ferry operators' field of operation, but globally opened up new niches and added traffic. The suppression of intra-European duty-free, differences in social legislation, ferry company strategies, and competition from low-cost airlines, much more than the Tunnel, influenced the constant reorganisation of cross-Channel traffic. History, the nature of shareholdings, and different group strategies contributed greatly to changing the cross-Channel ferry industry. 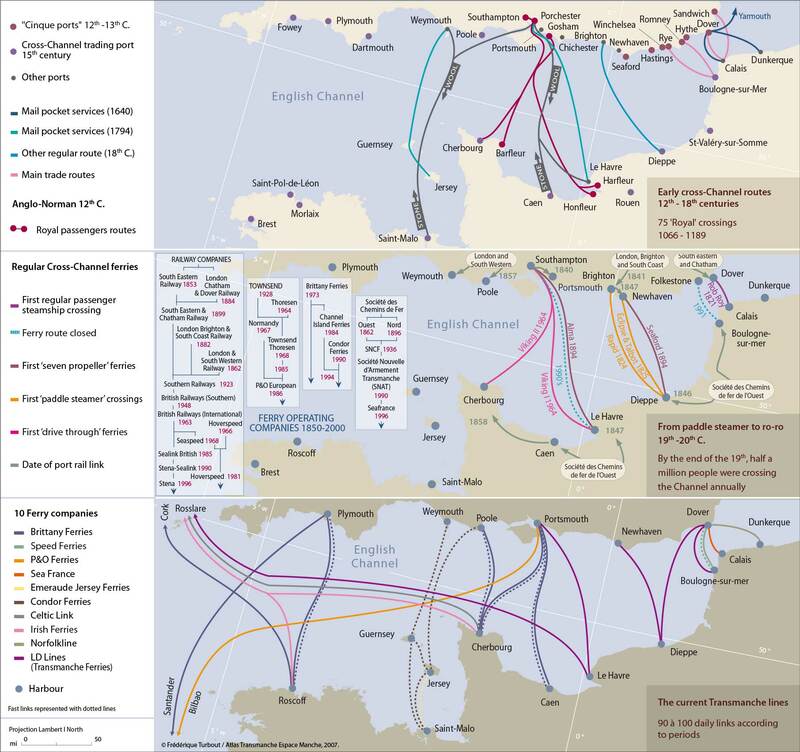 P&O and Brittany Ferries provide examples of typical trajectories. “Brittany Ferries” emergence as a company driven by a strong entrepreneurial imperative unusually owed its strength to a regional power base. From the start it was viewed as a key player in territorial and economic development where maritime transport provided a means. The Roscoff-Plymouth route was first of all designed to guarantee a commercial outlet for Breton agricultural products. It was later complemented by a rationale related to wider regional development, not least in tourism, that led the Breton local authorities, and subsequently their Norman counterparts, to invest in “Brittany Ferries” and thereby create a “regional” monopoly company. Today it totally dominates the western sector of the Channel. The P&O is above all an internationally-based company with wide-ranging interests in shipping, including the cruise market, as well as the property sector. Its reputation, of course, was as one of the world's first great shipping lines, opening up the Far East. Against this background, P&O's entry into the Channel arena would inevitably prioritise the financial profitability of its investment, leading in 2006 to its withdrawal from the central Channel routes, but still operating across the Dover Strait. By 2007, competition had diminished, and a dozen or so operators were running the 22 different routes. The introduction of high-speed craft has been the last substantial development in the ferry business. These very fast links mean one can travel from Portsmouth to Caen in 3:30 h instead of 6 h, and from Poole to Cherbourg in 2:15 h instead of 4.